Learn how to make Fluffy Buttermilk Biscuits to serve at breakfast, lunch, or dinner. 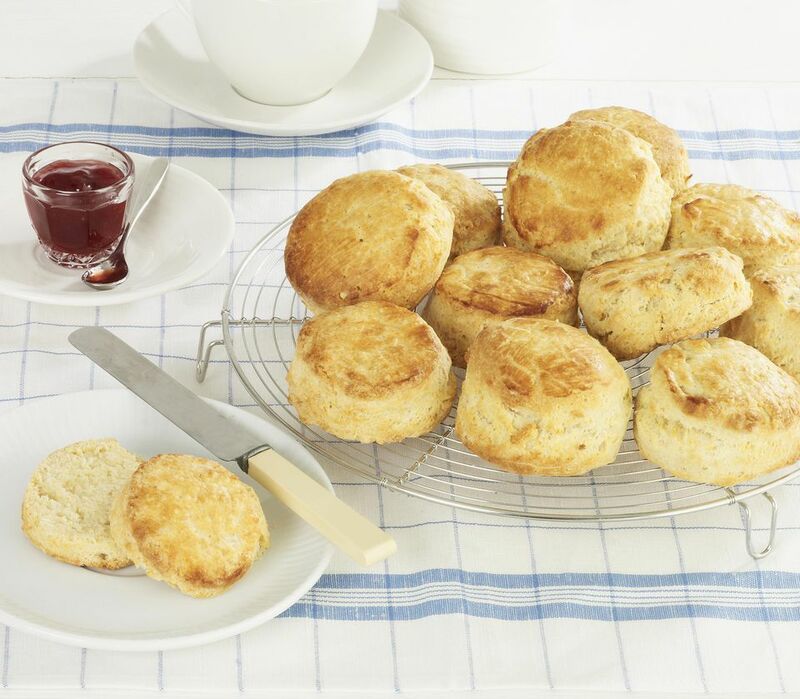 Buttermilk helps make biscuits moist and tender because it adds acid to the dough. That acid helps prevent gluten, the protein in flour, from forming too much. Too much gluten in biscuits makes tough biscuits. Cake flour is used in this recipe because it has less protein than regular all purpose flour, which makes the biscuits more tender. And cream is added because the fat helps separate gluten molecules; again, making the biscuits tender. It's important that the butter, buttermilk, and cream are very cold when aded to the dry ingredients in this recipe. Cold ingredients keep the butter in tiny pieces so, as it melts as the biscuits bake, the biscuits develop flaky layers. Serve these wonderful biscuits hot from the oven with more butter, jam or honey, and some iced tea. Preheat oven to 425°F. Make sure oven rack is in the middle of the oven. In a large bowl, combine the flour (make sure you measure correctly! ), cake flour, baking powder, baking soda, sugar and salt. Mix with spoon or wire whisk until blended. Cut the COLD butter into small pieces and drop into the flour mixture. Using the tips of your fingers, two knives (hold one knife in each hand), or a pastry blender, mash the butter quickly into the flour mixture until it looks like cornmeal, with some bigger pieces of butter still visible. When you start this process, it seems like it will never work, but keep with it! The proportion of flour to fat is correct. Then stir in buttermilk and heavy cream with a fork just until the mixture forms a soft, sticky ball. Don't stir the dough too much or the biscuits will be tough! Place the dough onto a lightly floured work surface and divide into 12 equal portions, using lightly floured hands. Toss the dough balls with floured hands a few times to smooth them out and form into rough balls, then place each on an ungreased cookie sheet about 1 inch apart. Brush the tops of the biscuits with the melted butter. Bake at 425°F for 10-14 minutes until the tops of the biscuits are light brown. Brush with more melted butter and serve immediately.